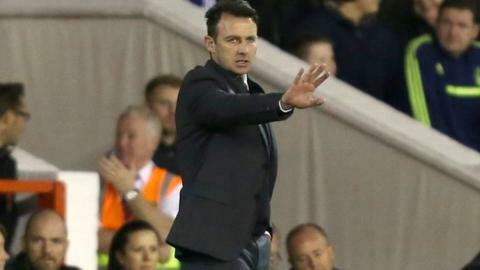 Nottingham Forest boss Dougie Freedman has insisted he is not feeling pressure despite a winless seven-game run. They lost 1-0 to Sheffield Wednesday on Saturday and are only four points above the relegation zone, having taken three points from the last 21. "There is enough confidence in the dressing room, and from myself, to say it will change. "Pressure only comes from within. I am desperate to succeed for this club," Freedman told BBC Radio Nottingham. "No one will give me more pressure than I do on my myself." Forest have only won three games this season - beating bottom-of-the-table Rotherham in their second league fixture, and achieving back-to-back victories over QPR and Birmingham in mid-September. Freedman, whose side face Preston North End on Tuesday, has said on several occasions that his side are playing better than their results suggest. "It is not as if we are coming away scratching our heads after a 3-0 defeat thinking 'where do we go from here? '," he added. "When these setbacks do come along, we must take them as a challenge and make sure we overcome them and not run away - and the players are certainly doing that."